September in the cutting garden and my Dahlias have been flowering since early July. Dahlias are one of the lowest maintenance, highest production cut flowers you can grow. In a good year, they can be in flower from late June to early December (especially if they are in a sheltered spot). There are a huge range of shapes, colours and sizes and you're missing out if you aren't growing them. Don't be put off if you don't like blousy, showy, pom-pom flowers, there are some lovely simple flower shapes too. Dahlias are frost tender so tubers should only be planted outside once all risk of frost is over. I start mine off in pots in the potting shed in March-April so there's plenty of time for you to browse catalogues to find the colours and flower shapes you'd like to grow next year. 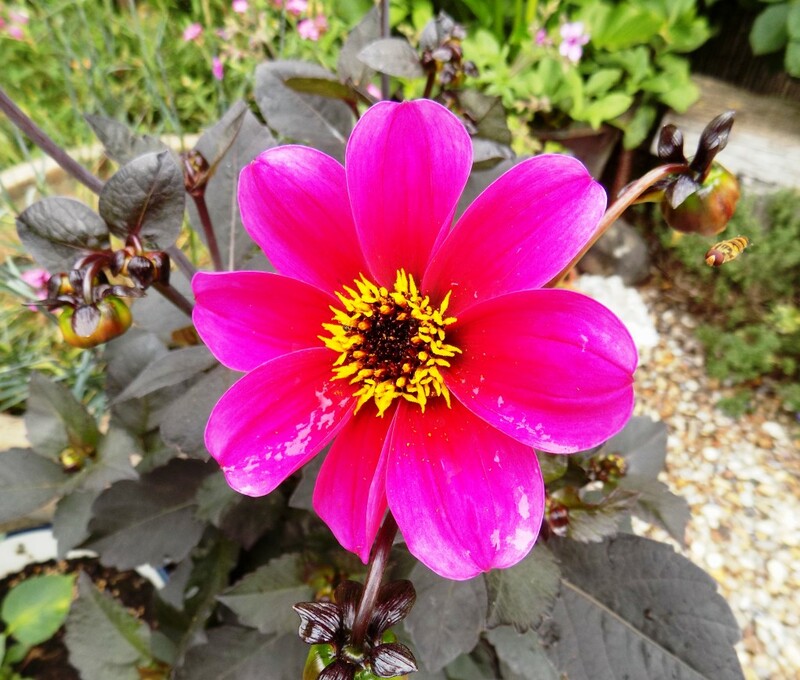 Dahlias are natives of Mexico and Central America and were first introduced into Europe by Spanish explorers. Most plants have 2 sets of chromosomes but Dahlias have 8 sets which allow them to be exploited by plant breeders to create numerous hybrids. There are over 1,600 different varieties registered with the National Dahlia Collection here in the UK. This year I seem to have focused on growing dark red Dahlias, having grown 3 types of a very similar colour but all with differing flower shape. In my defence, one, ('Sam Hopkins') did come free with a bulb order and I think it has become my favourite Dahlia. Dark red is a colour that looks great as the light levels change in Autumn and adds a jewel-like tone to arrangements. It looks great with soft pinks and with blues. I've also grown a hot pink variety as a contrast and tried to grow a white variety 'Blanc y Verde'. This has been a lot slower-growing than the others but is just showing signs of coming into bud as I write this article. Spherical heads made of 100s of tightly packed half-furled petals. 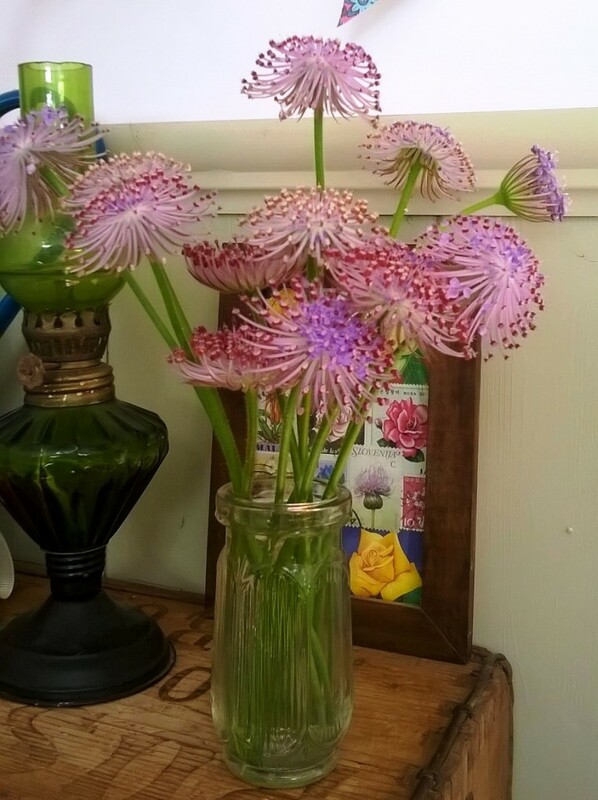 Very large pompon heads can be difficult to use as cut flowers but there are some smaller ones which work really well in mixed arrangements or displayed simply on their own. This type have flat, daisy-shaped flowers with 8/9 petals and these simple flower forms are best if you want to attract bees and other pollinators to the garden. They can be bruised easily and don't last that well for cutting compared to some other Dahlias but I love the simplicity of them. Dahlia 'Roxy' is a vibrant pink with lovely dark foliage is is a smaller variety great for pots. The flower heads are comprised of 100s of spiky petals and even though the pollen is hidden deep inside it is still accessible to pollinators. I've grown 'Nuit d'Ete' which is a lovely dark red variety. A more relaxed version of the cactus variety with less spiky petals. 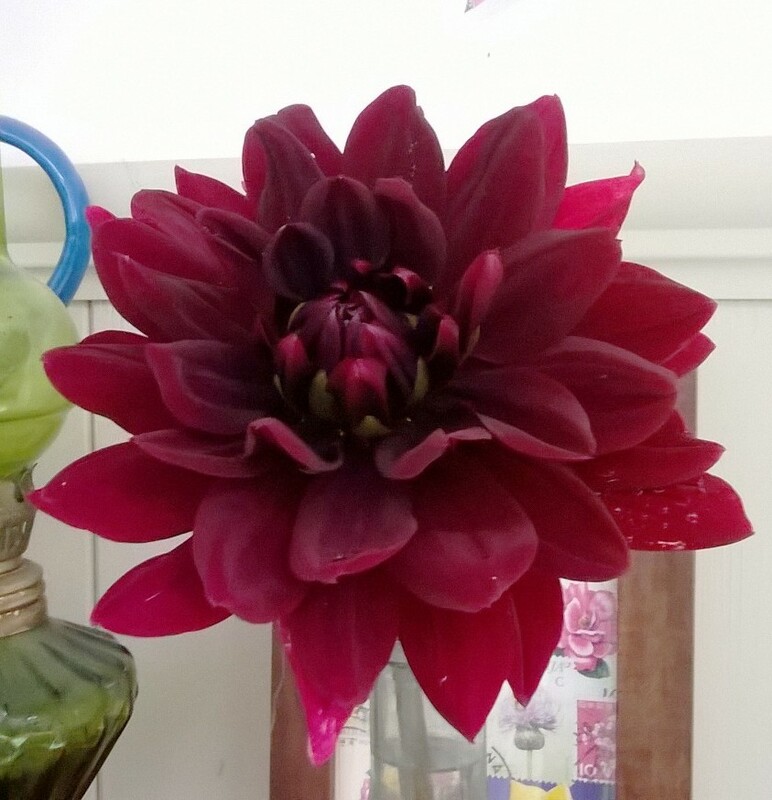 Possibly my favourite type of Dahlia with an exquisite double flower head. One or more rings of flattish petals surround a densely packed centre made up of tubular florets that point upwards. 'Blue Bayou' is beautiful with lavender outer petals and deep purple pin cushion centres. I had a lovely one last year but the tuber went mouldy over the Winter. Definitely one I will grow again. Vast flowers the size of dinner plates. A bit unwieldy for flower arrangements. Waterlily shaped flowers. Many of the Karma series which are thought to be some of the best lasting of the Dahlias as cut flowers are this elegant flower shape. Softer than the pompon/ball varieties but still with hundreds of petals. Not quite a cactus or a waterlily. Good for cutting. I've grown dark, velvety-red 'Sam Hopkins' which is stunning as is the similarly coloured 'Arabian Night'. Earwigs can be a problem with dahlias. They love eating the flowers and leaves and I often get surprised by an earwig or two when I bring them into the house so it's a good idea to give them a bit of a shake before bringing them in. You can also try to control them by placing pots filled with straw upside down on top of canes by your Dahlias. The earwigs will crawl into the straw during the heat of the day and at the end of the day you can remove the pots and dispose of the earwigs however you wish. Slugs also love dahlias, especially when they first shoot, so you will need to protect them as soon as you pot them up. 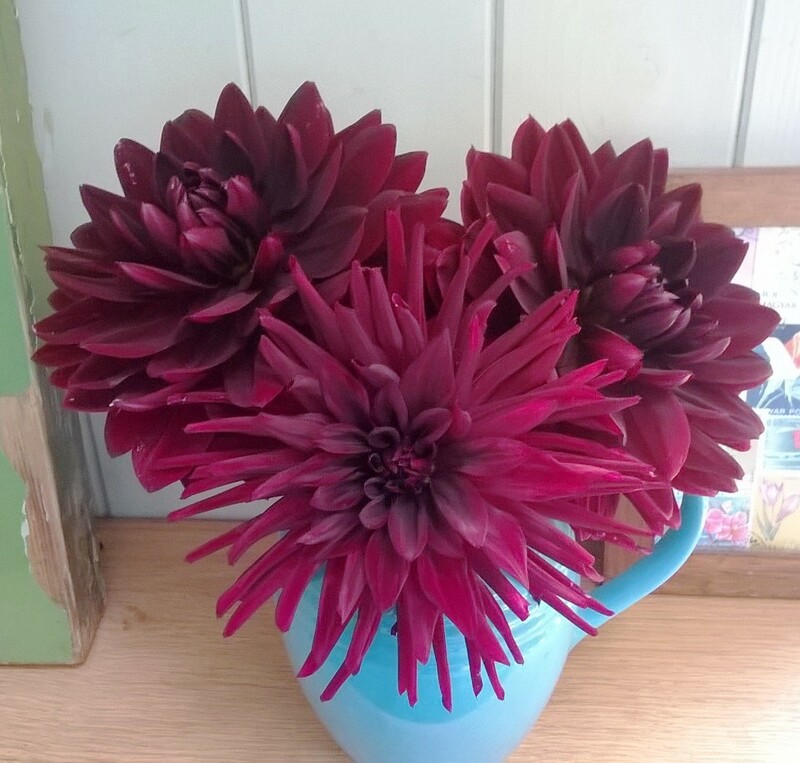 Only pick dahlias in full flower as they will not always fully open if cut when emerging from the bud. Re-cut the hollow stem ends under water to avoid air locks. Deadhead your Dahlias regularly if you don’t pick every flower for the house. This improves how the plant looks and will prolong flowering. For more Dahlia inspiration and to view all Dahlias mentioned, visit my Pinterest page. Why grow bulbs in the cutting garden? Bulbs are a great choice for a cutting garden as they don't take up a lot of space and can be squeezed into small gaps in borders or raised beds. There are a huge range to choose from and the secret is to grow a few of each type of bulb for real variety when cutting for the house. They'll fill the gap before your annuals and bi-ennials start flowering beautifully. Some start flowering very early, like Snowdrops and Crocuses. 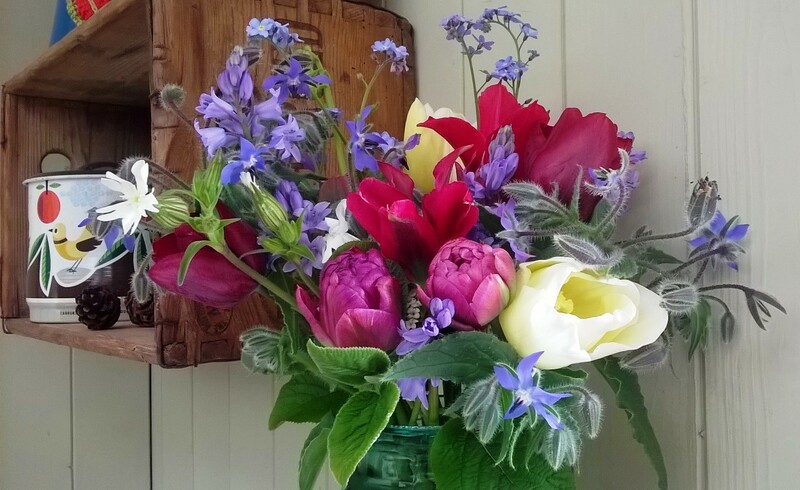 Even just bringing a few cut flowers into the house in February will bring a real taste of Spring and the flowering season to come, in what is typically a gloomy time of year. 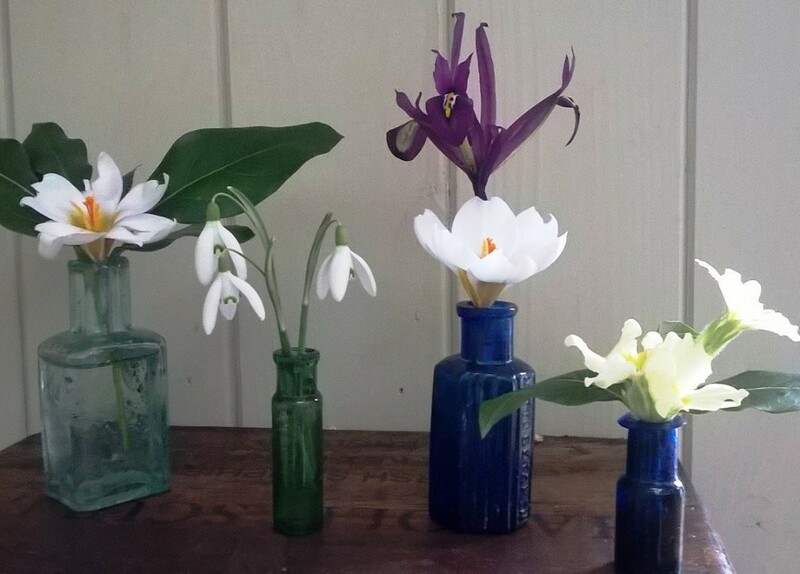 Small flowers benefit from being displayed on their own in tiny glass bottles or you can bring in potted up bulbs for a longer display. September is a good month to start bulb planting and it's best to aim to finish planting before the end of September, although I often go into October if I spot some bulb bargains! Start with Narcissi, Alliums, Crocuses and Muscari - Tulips should be left until November to guard against Tulip Fire. Plant soon after buying or at least take them out of any plastic packaging and store in a paper bag in a dark cupboard if you can't plant them straight away. Good drainage is important. If you have heavy soil then you can add some grit to the bottom of the planting hole. If using pots, have plenty of crocks at the bottom. Bury bulbs at twice the depth of their size, tip upwards and firm in well to ensure there are no air pockets around them. Use them to fill gaps in beds and borders. If you are growing them solely for cutting, then devoting a raised bed for bulbs is ideal. I use one raised bed, which I also use to grow annuals in during the Summer, for my Tulips. Once the annuals have finished flowering in November, I plant out my Tulips - either new bulbs or some that I have lifted and stored from last year. In the other raised beds, I plant my bulbs around the outside so that they can be left in after cutting for the following year. This works well for small bulbs like Iris reticulata and Muscari. Make your life easier by investing in a strong good quality dibber or if you have a bad back, a long-handled bulb planter. For a natural look in borders, throw handfuls of bulbs in the air and plant them where they land. I love early spring bulbs like Crocus and Iris reticulata. If you cut them, they will only last a day or two. If you have lots of spring bulbs outside, cutting a few here and there every few days isn't a problem. But if you don't want to destroy the outside display, a better idea might be to plant a few in small pots. Pot up a few bulbs in small terracotta pots, every week throughout September/October, and then when they flower, bring them inside in their pots so you have a progression of bulbs in flower when flowers for cutting are so scarce. If you are interested in forcing bulbs for flowering at Christmas time, then Sarah Raven offers good advice. While we're talking about Christmas (sorry! 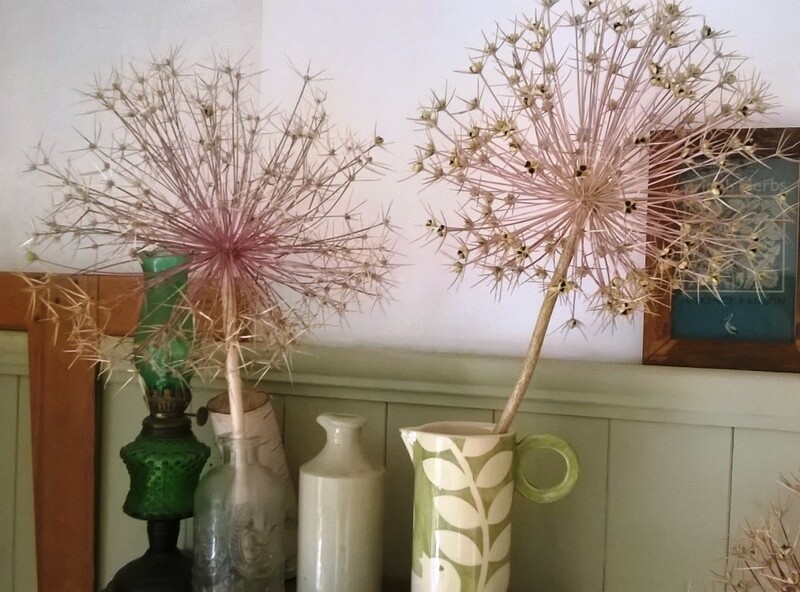 ), I cut down my Alliums, back in July before the seed heads had weathered too much, and have dried them out by placing in bottles on my shelves. As well as looking rather lovely as a display now, I will spray them silver in December and use them as a natural Christmas decoration. After a long Summer holiday, my children have gone back to school, so let me fill you in on what has been going on in my cutting garden over the Summer and what I'll be cutting this month as we proceed into Autumn. The hardy annuals, which were flowering so well at the beginning of the Summer, are still producing a good number of blooms but are showing signs of slowing down. In a couple of weeks, I will clear these annuals and plant out my Sweet Williams which are growing on well in the potting shed. These include Cornflowers, Amberboa muricata (which have suffered a bit of mildew on the leaves but are still producing useful blooms) Lupins and Malope trifida. My Larkspur have already been taken out as they were looking very weedy and yellow. The real stars at this time of year are my Cosmos and Scabious. I have a mix of Cosmos 'Click Cranberries' and 'Rubenza' which, while I love the colour of the flowers, have seemed a bit weedy in comparison with Cosmos 'Purity' which is romping away. It could be that they are being overshadowed by the taller growing 'Purity' so I will grow them in separate beds next year. My Zinnias should be doing really well, but have been a bit disappointing, with some plants failing completely and some just producing the odd flower here and there. They are bulking up slowly so I may be rewarded with more flowers later this month. Zinnia seedlings dislike root disturbance and can sulk if you grow them in pots and then plant them out. This is what I did this year, so next year I will try sowing them directly where they are to grow and see if I can produce better plants. It's not all doom and gloom though. The big successes this year have been my Scabious 'Black Knight' which I love, with its large dark red, velvety flower heads. In contrast, the less showy but very elegant, Scabious 'Tall Double Mix - white' is a small, pure white, pincushion flower which looks lovely dotted throughout an arrangement. My Didsicus (Blue Lace Flower) have produced lots of lovely lacy flowers and they continue to look good once the petals have fallen off. I have been leaving a lot of them on the plant until they reach this stage as the spidery flower structure is stunning. I've grown Panicum grass for the first time this year and really like the frothiness of the flowering seed heads. I also have some late-sown Salvia viridis and Ammi majus starting to produce useful foliage and filler material in my cutting beds. I planted these out after taking out the Larkspur and some Bupleurum seedlings which had failed. It's really useful to have some replacement seedlings on hand to replace any plants that fail to perform or fill any gaps. If you sow a few extra annuals when the first batch of hardy annuals are just coming into flower, they should be ready to plant out when other annuals may be going over. 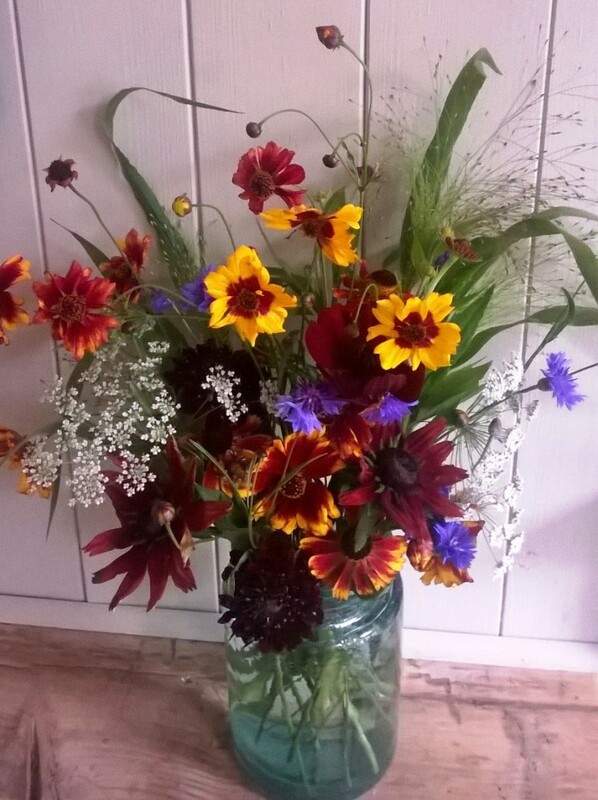 Other annuals worth a mention that are now appearing in my arrangements, are Coreopsis 'Incredible Tall Mix', with its almost Helenium-like flowers in a range of yellows and reddish-browns, and Rudbekia 'Cherry Brandy'. I didn't have much germination success with my Rudbekia, with only one seedling coming up, but I absolutely love it's dark cherry-red blooms and it looks great with the Coreopsis. I've had a bumper crop of Dahlias this year. I've grown them all in pots and have watered them almost daily when it has been dry, but we've had a lot of rain over the last few weeks so this means less watering. I also give them a liquid feed every couple of weeks as they are hungry plants, especially if grown in pots. Elsewhere in the garden borders, I've been cutting lots of Fennel and Oregano as filler and foliage material, Knautia macedonica, Lavender, Mallow, Verbena bonariensis, perennial Scabious, Heleniums and Japanese Anemones. I'm looking forward to my Sedum 'Autumn Joy' flowering later this month. The plants are small, as they were planted in the Spring, but I love the form of them and they are great for some Autumn colour in the garden. Keep picking, dead-heading and watering where necessary. 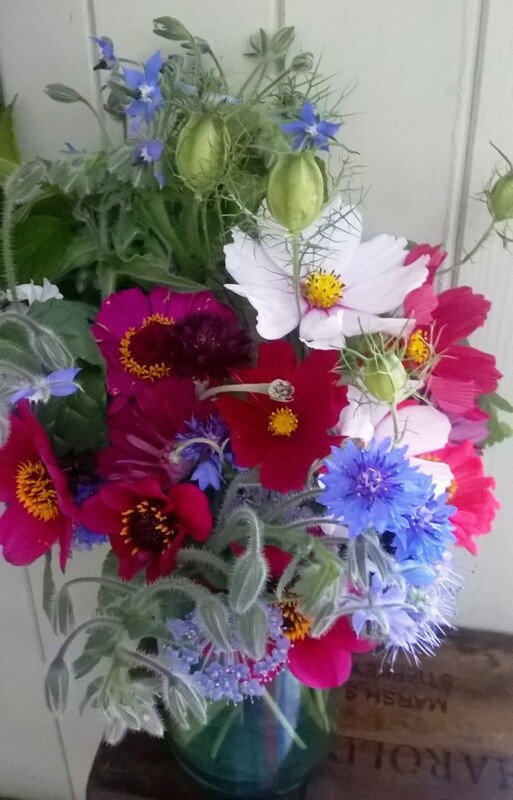 When annuals start failing - typically the hardy annuals you planted out first - like Cornflowers, annual Lupins, Amberboa and Larkspur, pull them out and compost them and replace them with any bi-ennials that you have grown or can buy from the garden centre. I've got some Sweet William 'Sooty' - a dark maroon/chocolate form and Sweet William 'Single Mixed' with a range of different shades from pale pink to red. 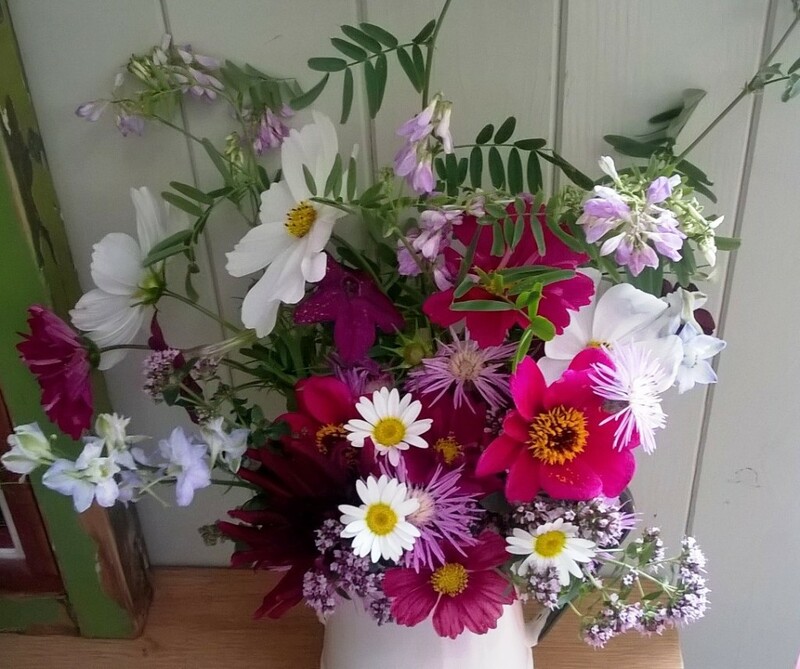 Other bi-ennials that make good cut flowers include Sweet Rocket, Foxgloves and Wallflowers. I will start sowing some hardy annuals (Cornflowers, Ammi and Sweet peas) to over-winter for planting out early next spring once I've planted out my bi-ennials and have more space in the potting shed. You can also start planting spring bulbs such as Daffodils, Crocus and Muscari, if you have space in beds and borders. Leave any Tulip bulbs until November as they will be less prone to Tulip Fire if you plant them later when the weather is colder. Tulip fire is a fungal disease caused by Botrytis tulipae, which produces brown spots and twisted, withered and distorted leaves. It is so named because plants appear scorched by fire. I've been pouring over the bulb catalogues and it is easy to get carried away but I've been trying to visualise how the flowers will look in the vase together before making any final decisions. I'll cover more on bulbs in my next post.